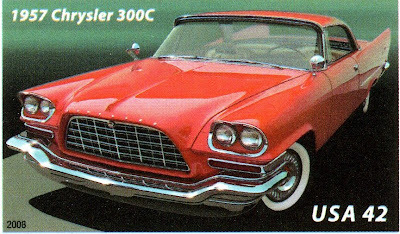 My first car was a 1957 Chrysler 300C. I bartered it for painting an old Mobil gas station which had been turned into a used car lot. I got to pick any car on the lot. To the best of my knowledge, I think the year was 1966. I'll never forgive myself for not keeping the 5 ft wide metal pegasus I removed from the facade and simply placed behind the building. The 2-door coupe was already a rust bucket. I drove it off the lot and over to my friend Marty Sober's house. His parents had a big fin Chrysler (not a 300) from the same era. He promptly walked over to the dual headlights, brought his hand down... and I watched in horror as his fist went right through the beautiful and stylish but rusted sheet metal. Then he asked me to open the trunk. He flipped the rubber matt to the side and easily put his foot through the floor of the trunk. It had a 440 hemi-head. The largest US production engine made. First thing we did was drive to Ocean City, MD. The speedometer went to 160 mph! Coming back from Ocean City, I came to a red light on Park Heights Avenue and was shocked when we sailed right through. It turned out that the master brake cylinder leaked, so I simply bought a gallon of brake fluid at Pep Boys and filled it up every day before I drove off. Ownership of this car was also my first glimpse of the cynical view of "the cycle of life" - I had to have the car to get to work, and had to have the job to own the car.... hmmmm? A beauty and a boat. Eventually I sold it to someone who was very excited to be able to use the engine in a drag racer. Actually a 300D, not C.